Samantha Leal is the online editor for Latina.com. Her writing has appeared on TheAtlantic.com, Glamour.com, and BULLETTMedia.com. Catch her stream of tweets here. I never much liked being born in the dead of winter. Growing up in the lake-effect-snow-ridden Midwest, this meant no pool parties, no outdoor picnics, and the definite possibility that your friends won’t make it to your party due to a massive snowstorm. But birthday candles continued to be wished on, and I continued to grow older. Being the girly girl I always was, once I found out that a gem was associated with your birth month, I was totally on board with the idea of birthstones. My older sister, born in March, got the coolest stone — aquamarine; the dazzling green-blue gem was the prettiest thing I had ever seen. I mean, the name itself conjured up images of princesses and mermaids. I couldn’t wait to find out what “garnet” meant. Would it be pink? Please, God, let it be pink. When I saw garnet for the first time, I was less than impressed. “It looks like frozen Coca-Cola!” I wailed, examining the brown-tinted, red stone that, I figured, was a representation of me in gem-form. What else is a 7-year-old to think? So, that was that. As friends and family gifted me with Coca-Cola rings, they inevitably found themselves in jewelry purgatory: the Beauty and the Beast jewelry box with a spinning Belle. 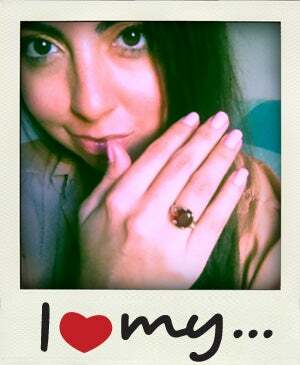 It wasn’t until I was in high school that I came to appreciate my birthstone. And, of course, the change in heart stemmed from one of the women I admired most in life: my Mamaw. My grandmother was a stubborn, quirky Southern woman with a heart of gold. She married Papaw when she was 15 and had but four pieces of precious jewelry: her wedding ring, her engagement ring, an anniversary ring, and her birthstone. Hers was also garnet, though if she had been born one day later it would have been amethyst. My family didn’t come from a lot of money. The “good” jewelry came from places that one might only dream of: the local jewelry shop. Marshall Field’s. Avon. So, when you had a “real” ring (not the cheapies you get that came with adjustable bands), you cherished it. And you wore that sucker. A lot. When she was struck with Alzheimer’s, and her health began to fade, I clung to the similarities between my Mamaw and I: our similar faces, our love of Milky Way bars, and our January birthdays. In essence, I came to embrace the garnet stone as a connection to her. When she passed, the ring was given to me. The band, which I know I’ll need to replace at some point, is so thin from years of wear that it’s barely there. The large stone, elevated and perched on top, keeps me grounded. It’s my favorite thing I own. It reminds me of my family, of my birthday, of my many blessings. It reminds me of my grandmother, the woman she was before her illness robbed her from me. But perhaps, more importantly, it reminds me that even though I was born in the dead of winter, I’m here, now. What a precious gem, indeed.